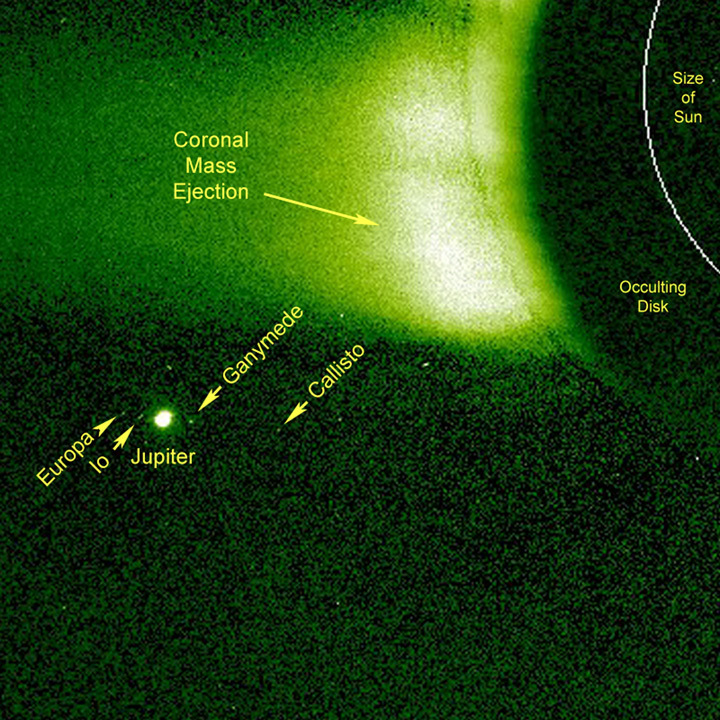 No one has been able to observe Jupiter and its moons for some time as it is too close to the Sun, but that did not stop the STEREO (Behind) COR1 coronagraph from capturing it and its four major moons over a 30-hour period (March 15-16, 2009). If you look carefully, you can identify three of its moons close to Jupiter, and even discern how their positions change as the movie progresses. Those with keen eyes can see the fourth moon, Callisto, as a fainter object well to the right of the others. These four moons are known as the Galilean moons, because they were first discovered by Galileo Galilei in 1610. Jupiter itself is largely saturated in the movie, to bring out the moons and the faint solar corona. The solid dark green area on the right is the coronagraph?s occulting disk that blocks out the Sun and some of its bright atmosphere to that our instrument can see fainter structure just beyond the Sun. The thin, white line inside of that indicates the actual size of the Sun. 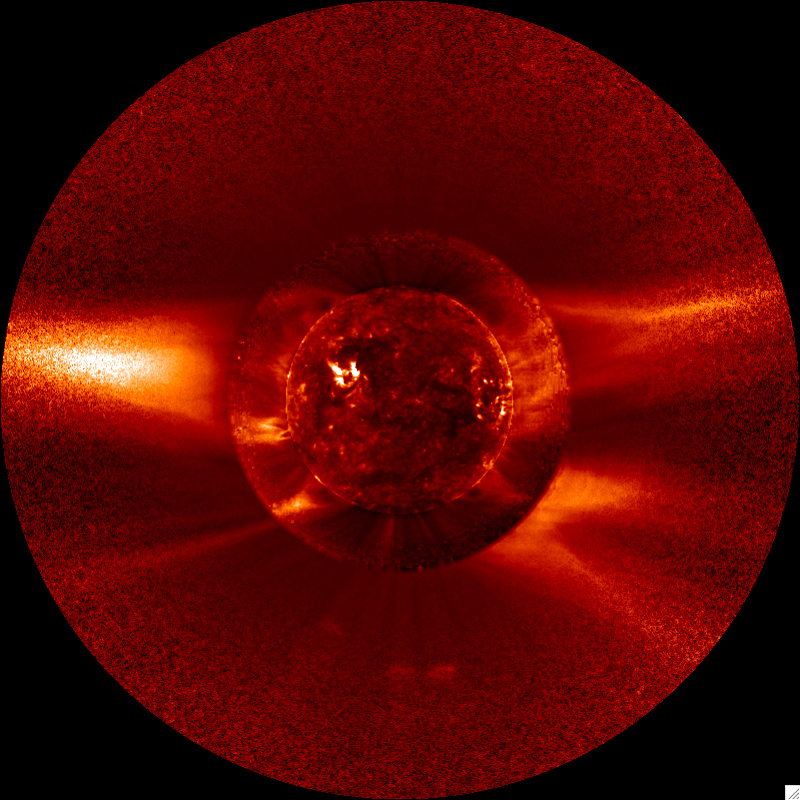 By coincidence, a coronal mass ejection is seen blasting a white cloud of charged particles out into space during much of the clip. We have not seen many solar storms of late as the Sun is near its low point in its solar activity cycle. 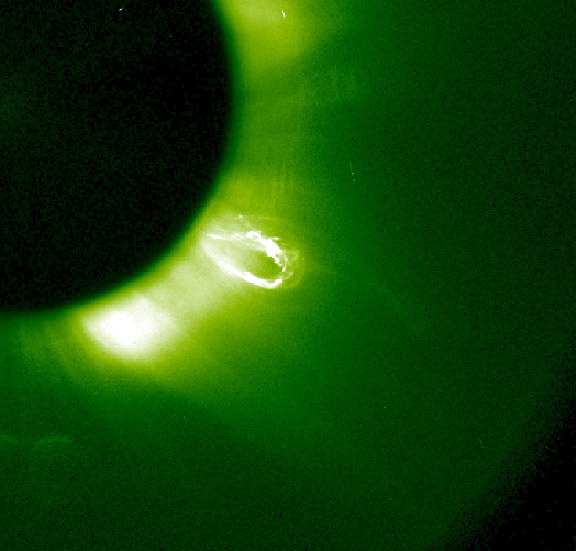 COR1 image processed using the Normalizing-Radial-Graded Filter (NRGF) technique as described in Morgan, Habbal, and Woo, "The Depiction of Coronal Structure in White-Light Images", Solar Physics, 236, 263-272, 2006. This technique enhances the contrast of coronagraph images, and makes it easier to see the fainter structures far out from the Sun. Normally we reject images contaminated with pieces of debris flying in front of the lens. However, this debris storm made such a striking image, looking like a flashback to the sixties, that we thought it would be fun to share it. What's happening is that a small piece of space dust has struck the thermal blanket material covering the spacecraft, and knocked off small flakes which have flown in front of the lens. The colors come about by assigning red, green, and blue to the three polarization angles making up a COR1 observing sequence. An erupting prominence glows brightly in this COR1-Ahead image from April 9, 2008. This is by far the brightest prominence seen by COR1 since the start of the mission. Complex twisting motions are seen as the prominence erupts. 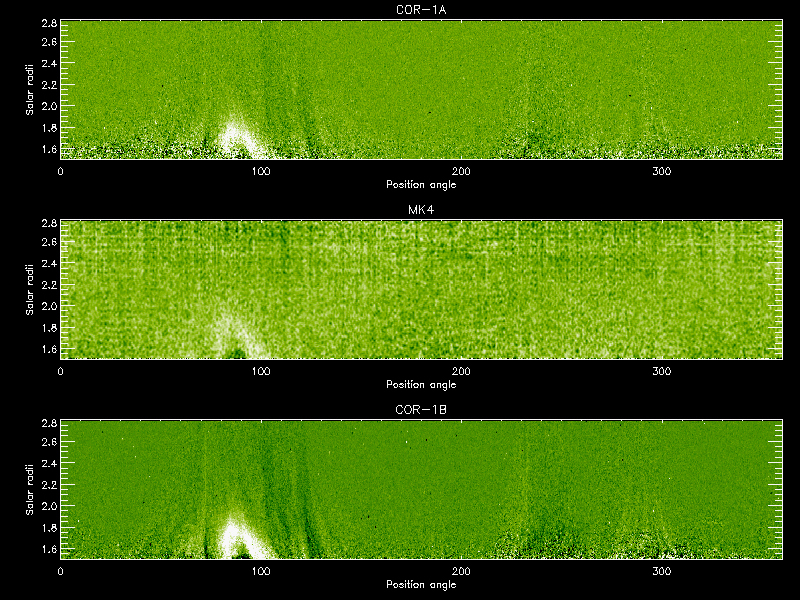 An outward bound piece of space debris is captured in these successive COR1 polarization sequences. Occasionally, small pieces of the thermal blanket material surrounding the spacecraft are dislodged by micrometeorites and travel across the field of view of the STEREO coronagraphs. These pieces of debris usually look like donuts because they're so close to the lens that they're tremendously out of focus, and take on the appearance of the telescope aperture, with the occulter in the center. COR1 takes three images in rapid sequence at different polarization angles to make a complete measurement. 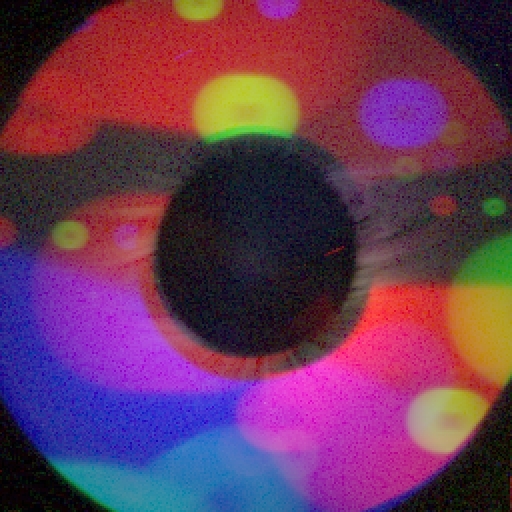 Here the three images are laid on top of each other colored red, green, and blue, so that one can follow the motion of the particle. 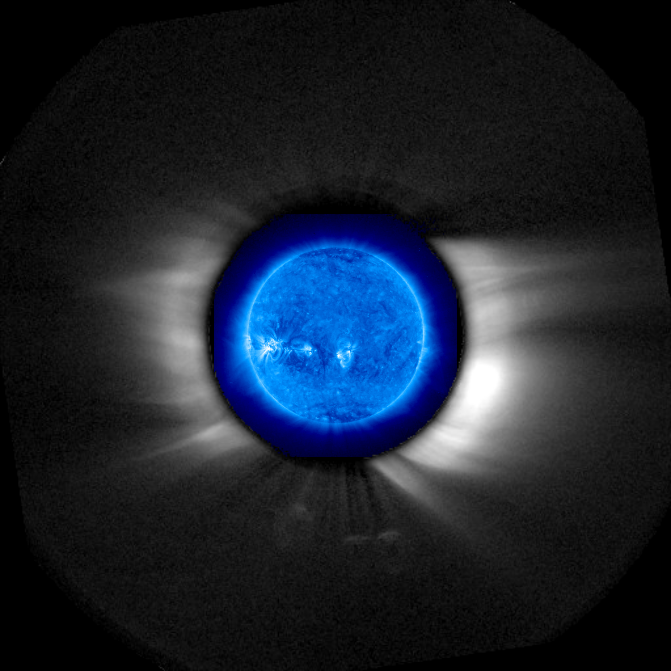 (The solar corona appears colored in these images because of its high degree of polarization.) It's not unusual to see such debris particles in the COR1 images, but it is unusual to see the same particle in more than one image sequence. The image on the right shows the same particle as on the left five minutes later. The apparent size is smaller, which means that it's traveling away from the telescope, as one would expect for something ejected away from the spacecraft. The MkIV data at these heights are noisier than the COR1 data, but one can see that the same CME appears in all images. 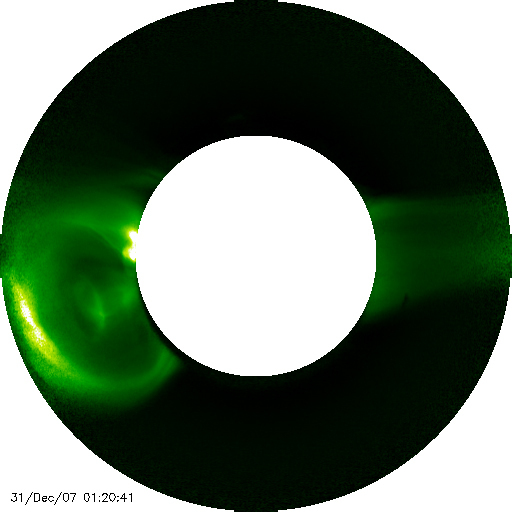 Some smoothing has been applied to the MkIV data to help bring out the CME. 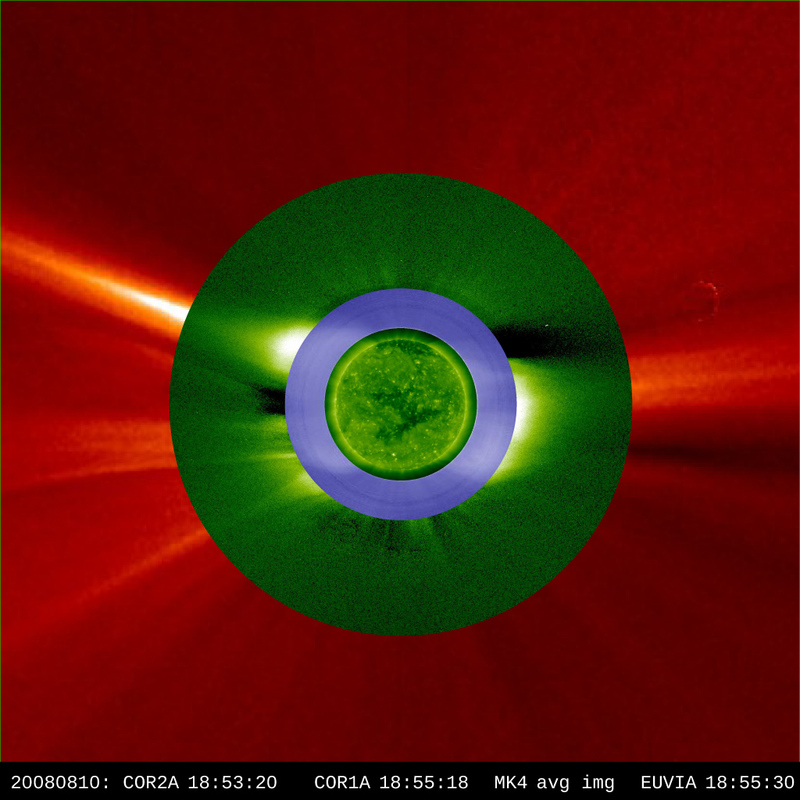 This composite STEREO EUVI-A/COR1-A image from 2007-April-01 was provided by Dr. Huw Morgan at the University of Wales. He has removed the background from the original images using the normalizing-radial-graded filter (NRGF) technique described in Solar Physics, vol. 236, Issue 2, p.263-272, 2006. The planet Mercury as seen by the two COR1 telescopes on May 3, 2007. Also shown is the calculated position and size of the solar disk, while the smaller circles highlight the position of Mercury in each image. These data allowed the COR1 team to derive the 3-dimension position of Mercury in the solar system. By checking the result against the known position of Mercury, the COR1 team was able to validate their pointing calibration. As far as we are aware, this is the first time that the position of a planet has been measured by direct triangulation. This is a 2D histogram of the intensity in COR1-A versus COR1-B (a pixel-by-pixel comparison). If the cross-calibration between the two telescopes was exact, you'd expect the points to lie along the dashed line, representing B=A. Instead, they lie along the solid line representing B=1.3*A. This is not a bad thing! All the points lie along a fairly narrow straight line, rather than being scattered, so the cross-calibration is quite good!